Uber is to merge its Russian business with local competitor Yandex, after the US ride-hailing firm spent millions to build a presence in Russia and other countries in the region. 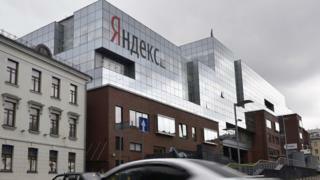 Yandex, compared to a Russian Google, will own about 59% of the combined company, valued at $3.7bn (£2.9bn). The deal heads off competition from Uber, which launched in Russia in 2014. Their rivalry had fuelled a price war. Yandex's stock climbed 16% on Thursday. Tigran Khudaverdyan, who heads Yandex.Taxi and will be boss of the new company, said the combination will boost rides for drivers and reduce wait times for passengers. "This combination greatly enhances Yandex's ability to offer better quality service to our riders and drivers, to quickly expand our services to new regions, and to build a sustainable business," he said in statement. Is ride-sharing giant Uber giving up on its China dream? Yandex, which started in 1997 and has a search engine and other services, launched its taxi business in 2011. It is about twice the size of Uber's, according to data released to investors Thursday. Yandex will contribute $100m to the new company, which will operate in 127 cities in Russia, Azerbaijan, Armenia, Belarus, Georgia and Kazakhstan. Uber, which will invest $225m and have a roughly 37% stake in the combined firm, sought to cast the deal as a way to make its finances sustainable and build on its growth. The San Francisco company has been under pressure from investors to stem losses and move past a string of scandals that led to the ouster of its long-time chief executive Travis Kalanick. "This is an exciting opportunity in a unique situation and our operations in other countries will not be affected," Pierre-Dimitri Gore-Coty, head of Uber's business in Europe, the Middle East and Africa, wrote in an email to employees posted on the firm's website. Uber has also been recalibrating its global expansion strategy. This spring, it said it would withdraw from Denmark after Denmark imposed tougher regulations. Last year, it sold its Chinese business to rival Didi Chuxing after losing a reported $2bn trying to break into the market. In exchange, Uber received a stake in the combined company. The arrangement with Yandex is somewhat similar. Uber said it had invested $170m over three years in Russia, Azerbaijan, Belarus and Kazakhstan, establishing itself in 21 cities. But it faced a more established competitor in Yandex, which has a much bigger presence in the region. The merger is expected to give the firm 5% to 6% of the Russian taxi market. Together, they deliver about 35 million rides each month. "If you think about the opportunity ahead, I think it's tremendous," said Greg Abovsky, chief financial officer at Yandex. If approved by regulators, the merger is expected to close by the end of the year. The companies said both brands and apps would remain active for consumers. The two companies will integrate the apps for drivers. Uber's food delivery service UberEats will also be part of the combined firm.